This is how Laguna Beach does picnics! Picnic Beach is a great location in Laguna Beach for family gatherings! 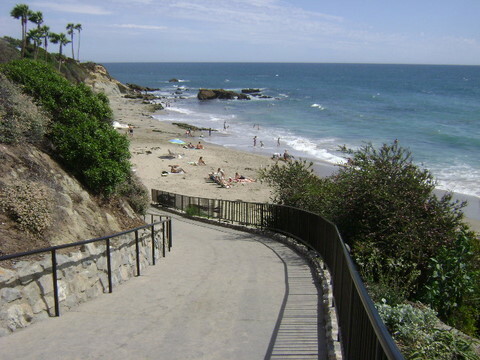 There is a walking ramp providing direct access from Heisler Park! The moderately sloped ramp makes it easier to carry down “wheeled” ice-chests and gear for however you want to spend the day! There are also public restrooms coveniently located just above Picnic Beach in grassy Heisler Park. Picnic Beach is a five-to-ten minute walk to many restaurants in North Laguna. My favorite local dining spot Madison Square Garden is very close, right across the street where Coast Highway converges with Cliff St & Aster. The Cottage is also on the same corner. And Las Brisas is located really close as well! You’re also close to Gina’s Pizza! (the North Laguna location)!! But if you’re spending the day at the beach and just thinking about grabbing some take-out and bringing it back to your spot on the sand- you may want to make the walk to BJ’s Pizza, Johnny Rockets, or any of the many restaurants along Broadway, Forest, or Ocean! Starbucks also has two locations fairly close. And if ice cream or frozen yogurt are your weakness- Haagen Daaz, Golden Spoon, Gelato Paridiso and Chantilly Ice Cream can be found nearby! Metered parking for Picnic Beach can be found along Cliff Dr, Coast Highway, and on several side streets. If you prefer to not pay for parking and don’t mind walking, you can usually find free parking farther up in residential neighborhoods- just make sure to not block anyone’s driveway! Picnic Beach is located on Cliff Dr north of Rockpile Beach and Main Beach. The easiest access is through Heisler Park using the access ramp.